During the process known as “forty years in the desert,” which is the majority of the Torah—which narrates primarily what happened in the desert—we prepared ourselves. We corrected ourselves and discovered our nature each time anew. We discovered how wicked we are, we ran into trouble, we committed sins and were repeatedly punished for it. The process we went through in the desert qualified us for the correction of our Kelim, the correction of our desires from reception to bestowal, from intentions to benefit ourselves to intentions to benefit others. The correction takes place through suffering from above or through our own understanding of how to correct ourselves. In this way we achieve a state called “the land of Israel,” in which we are more or less ready to turn our desires from benefiting ourselves into benefiting others. In the beginning of the desert, by Mount Sinai, we corrected all of our 613 desires from which our corrupted souls consist, having been created that way, as it is written, “I have created the evil inclination.” We reached a state where we did not wish to harm others, which is called “passing the desert.” Now, right before the entrance to the land of Israel, we must correct our desires so that with them we will do good to others. The work of the desert is “that which you hate, do not do to your neighbor.” The intention to favor others is called “love your neighbor as yourself.” This is the next stage, the conquest of the land and the work in the land of Israel. This is our work, our correction, to aim our desires from ourselves to others. This is why we were given the Torah, as it is written, “I have created the evil inclination, I have created for it the Torah as a spice.” If one aims oneself to this work, it is called “studying Torah,” “serving the Creator.” This is how we perform our correction. If we do this here and now, in our lives in this world, if we carry out these two stages in the work, these two degrees, we will traverse the desert, reach the land of Israel, and achieve the end of correction. The more we advance through the desert toward the entrance to the land of Israel, the more we can see how our demand for correction becomes better focused, more concrete, more practical, and clearer, so it can be explained in practical terms to any person who advances and corrects oneself into love of others. This is why the portion speaks of stones, the building of Malchut and Bina, and the connection between those two degrees—the blessing and the curse. The uncorrected Malchut is the curse, and the corrected degree of Bina, to which Malchut joins, is the blessing. They stand as two mountains before a person who uses them, and the person stands between the blessing and the curse. Thus, a person stands between those two lines, building oneself as the middle line, and this is the structure of the corrected soul. The portion speaks of stones, of building the altar. The word Even (stone) comes from the word Havanah (understanding). A stone is the degree of Bina. We need to go above reason, above our understanding. We rise above it and acquire a truly Godly mind and heart, above our nature. Out of the awareness in this new attainment, we write on the stones, on Malchut, which is a stone, our stony heart. Although the heart does not wish to be corrected, we gradually bring it to corrections and build with it the altar. The portion speaks of the tithing, the tenth part, which is Malchut herself, the tenth Sefira that builds herself according to the amount she receives or does not receive. The portion also deals with the matter of the circumcision, which details how much we can or cannot use each desire in favor of others, what we do with the part we cannot correct, and how we use it in favor of others, although it is still not corrected. The portion explains how we continue to seemingly correct it. We are talking about a process of recognition of evil in Egypt, the entrance to the desert and the land of Israel. Today the people of Israel are already in the land of Israel, but it seems that we still have not gotten into Egypt. There is a big gap between what is happening in Israel and where we are supposed to be. How can you explain this gap? Today we are in a different situation, which is why we do not need to go through all those degrees. By “we” I mean the group that assembled and connected to Abraham, that went out of Babylon and came to the land of Canaan, and from Canaan—following the degrees of Isaac and Jacob—went into Egypt. Egypt means that we have acquired our big egotistical will to receive, from which we wanted to escape because it was very bad for us. All that is negative in our lives comes to us because we are selfish, because we hate everyone and cannot avoid it. We bring these states on ourselves although we regret being pulled into these miserable states and worthless things. In this way we actually “finish” ourselves off, wasting our lives away on a lowly, animate degree, unable to rise to a higher level. Initially, we strive for something eternal and perfect, but life in this world leads us into a life on the animate level. It is hard for us to live like an animal, so we cling to the hope that life continues in the next world. If we were certain that there is no continuity, we would not be able to go on living in this world because that would make our lives completely meaningless and pointless. This is why so many people believe in the next world, the afterlife. The incarnations we have gone through have given us the understanding and the recognition. They have given us the drive to escape from Egypt, when we wish to obtain bestowal, Godliness, and to elevate our lives. We have already been through all the stages of scrutiny and correction. We have decided that we must exit our egos, and we want to rise above and move to another dimension of life. The reality we live in can be one of reception for ourselves, as we feel it now while we are immersed in receiving more and more. However, there is another reality, where we do not absorb inwards, but rather exit ourselves, transcending the animate degree where we are in a material body, and perceiving what exists outside of us. It is a special method, called “the wisdom of Kabbalah,” and we must learn how to act according to it, how to perceive the out-of-body reality. We still do not understand it, which is why it is called the “hidden world,” the “hidden method,” or “the method of the hidden.” It is a special instruction given to a person who truly wishes to exit oneself and begin to feel the reality outside of oneself, which is entirely bestowal upon others and love of others. This reality is completely opposite from the one we know today, where we give only to ourselves and love only ourselves, wishing to receive for ourselves and caring only about what is ours. Achieving this transition requires a process; is this the process described here? It requires a process of transition. This is why we are called “Hebrews,” form the word Avar (passing over, to pass over). Our whole work is to pass over. At what stage is this process now? Where is the people of Israel today in relation to this process? We have made the passing over, we passed through the desert. The correction was first done by exiting the ego. This is called traversing the desert and entering the land of Israel. That is, instead of receiving, we even began to bestow. We did it as a small country and a small nation that went out of Babylon. However, to correct the rest of the Babylonians, we had to be broken and to go through the ruin of the Temple, meaning to reenter the ego, the will to receive, and to be dispersed among the nations. The ten tribes scattered and today we have no idea where they are, but they are mingled among all the nations, and they are doing their work, as do we, who have now returned to the land of Israel. Something special is happening here, something that Kabbalists spoke about. We are returning not in order to live in Tel Aviv, Jaffa, or Holon, but in order to go through the stages of rising from the exile, out of Egypt, through the desert, to the actual land of Israel. We and the whole world are in these stages now. What is happening throughout the world today resembles the time of the Pharaohs. It is written that Pharaoh drew Israel closer to the Creator. He afflicted them, treated them badly, and threw them away so they would run from Egypt. This is how the Creator worked through Pharaoh. Pharaoh is really the Creator’s loyal servant, the servant of the upper force. Today we are feeling that these forces are affecting us and the entire world. They are truly like Pharaoh pressing us and we have nowhere to run. The current crisis is putting us in a situation that we cannot overcome or correct as we were used to. We also cannot escape from country to country. No place is better or worse because the crisis is happening everywhere at the same time, very clearly and very quickly. So the way up is by, “And the children of Israel sighed because of the work” (Exodus 2:23). What about the blessing and the curse? What is that mechanism? These are the two forces by which man advances. Is it the Creator’s doing? Of course the Creator is doing it. From the very beginning He says, “I have created the evil inclination,” meaning He admits it. Our entire evolution is advancement through the “whip” that stands behind us, repeatedly coming down on us and goading us forward, while we have no choice but to run ahead and advance at its pace. If we want to advance at the pace of the whip, it is called “in its time.” In this way we advance through beatings. But if we want to move faster than the beatings so they do not touch us, we need to move ourselves a little faster, in “I will hasten it,” meaning we need to rush time, as it is written that Israel sanctify the times, making them shorter. In other words, there are two options from the beginning. Yes. One option is through the curse. This is also a correction because blows are corrections. The other option is through the blessing, when we are drawn forward. We learn that we need to include all our desires, so what happened at Mount Sinai, when the people agreed to be as one man with one heart? There is no need for anything more than that. We receive everything else. Of course there is a lot of work that must be done, but we receive help, support, an instruction called “Torah,” a force that is Moshe (Moses), which Moshech (pulls) us faster forward and thus prevents the blows from reaching us. For the most part, the Torah speaks of things we go through against our will. It does not say that a person can go through everything in a good and pleasant way; it only points to the obstacles ahead, like a guidebook that marks obstacles, problems, transgressions, and so on. If we go through the path according to our nature, without promoting ourselves through the guidebook, we will suffer curses. This is our path—there are curses in it, punishments, and problems, because we are a “stiff-necked people,” as we have seen throughout the road in the desert. The Torah does not take into account the fact that we can rush ourselves faster than the whip that whips us. Is our choice only whether to go through the process favorably or unfavorably? Our choice is only to run ahead toward the good, toward bestowal and love. And we cannot change the overall plan? No, but we can experience it differently, in a favorable and desirable way, to feel it as a good life. It is like a little child who does not want to go to school, so the child feels everything as pressure, beating, and suffering, as a truly hard life. If Mount Gerizim stands opposite Mount Eival, there are seemingly good and bad, so we will certainly choose the good. In that case, where is the choice? The problem is that there is concealment. If a person knows what is good and what is bad, there is no choice here. By nature, we are drawn to the good and avoid the bad. But if there is concealment, we do not know which is bad and which is good. I have given you a blessing or a curse does not mean that on one corner we have someone who beats us up, and on the other corner stands someone who bakes us cakes. If that were the case, it would be obvious where we would go because there is no choice here. But in this way we would be like puppets on strings, not like human beings. A human being is one who has grown above one’s beast, who is not drawn to the good that seems like a cake, nor runs from the bad where there is the curse. Rather, such a person tests oneself in relation to truth and falsehood. It is possible that what seems as a curse now is actually the truth, and that which seems like a cake is the lie. We need to elevate ourselves above the good and the bad that appear as such to our gut feelings. We need to raise ourselves according to our awareness, by being drawn toward the truth and not toward falsehood. This is the scrutiny that is so difficult for us to make. The truth is the point, a degree called “man,” who is similar to Elokim (God), where He is the standard, the highest place we must reach, and which includes everything. 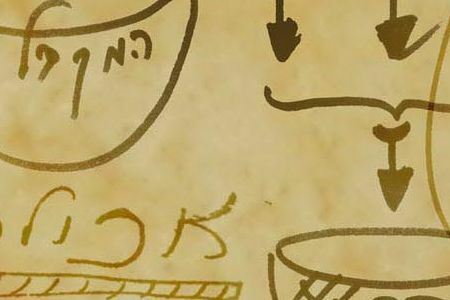 We need to come to a state that is to us as both truth and falsehood, good and bad, where everything connects into one place, as it is written, “I have created the evil inclination, I have created for it the Torah as a spice.” It is a place where all the beginnings connect, as it is written, “All my thoughts are in You” (Psalms 87:7). Why then is it built this way, with all the conditions and concealments? It is so in order to give people a chance to choose. Otherwise we will be as machines. But people neither care nor want to care. They cannot choose anyway, so at least they should have a good life. No, the whole purpose of creation is to turn us into human beings. A person who chooses regardless of good or bad elevates him or herself above the corporeal scrutiny. If the Creator is benevolent, why did He draw us a path that is not easy, that most of the time it is unclear how good it really is? Assume that a person turns on his vacuum cleaner and walks out of the house, while the vacuum cleaner is cleaning the carpets. This is what we look like today, and it seems as though we want to stay that way, walking around like robots, hitting one corner and turning to the other. Would we want to have this mechanism that keeps directing us in life this way? If so, where is the human here? We are not; we only feel as though we are alive, letting each day go by until we die, as long as we do not suffer. The Creator’s purpose is precisely to show us the most sublime challenge, against the suffering, the difficulty, and despite the problems we are in. Our world is advancing toward a no choice situation, toward a crisis we cannot mend, and which we cannot exit or survive. Either we take upon ourselves the work of being human, or we will be forced into that position against our will. Against our will means it will be done by blows, until we say, “We want it.” Therefore, we should learn to agree to the work we have been assigned to do, and then the good will immediately open up to us. “And Pharaoh drew near, and the sons of Israel looked, and behold, the Egyptians were marching after them, and they became very frightened; so the sons of Israel cried out to the Lord” (Exodus, 14:10).